I love the serial podcast. I listened to it while I painted my kitchen. I love that it starts with her saying I spent my year trying to figure out what a group of teenagers did on an afternoon ten years ago. Well I am trying to figure out what happened on a day last month to make my usual page views per day shoot up to almost 500. It just happens on one day and then back to normal. I must have missed my 15 minutes of fame. I am rescuing another furball this week. 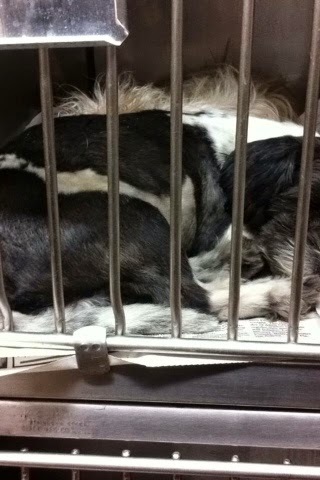 I can't remember if I ever mentioned that I hope to one day start a Shih Tzu rescue. I am so in love with that breed. It happened the first moment I ever met one. Well this week I noticed one online it was at a shelter. Its very scared and half blind and half deaf from neglect. Its going to the vet this week so we will know more about it. But I had to have it. I couldn't let that sweet baby spend another night in the shelter. So as soon as he has his vet visit I will have another member of my menagerie. We are eyeballs deep in volley ball, drama and choir, for Emmy and Band for Abbey. Thankfully Academic Team is over for now. I am kinda thinking about a blog name change. I know I just did that last year. but I can't help it I get bored. Cat hair and Glitter. Abbey ran her hand on my dashboard and said why is everything covered in cat hair and glitter. I instantly loved it. Because its the truth. We are suppose to get another 6-10 inches of snow. On the bright side I have a ton of days saved up that I could take off if it gets bad, I DON'T need to make the journey to the store for milk and bread. unless one of the girls sleep walks and eats it all. We are good. I'm just dreading shoveling the driveway again and the possibility of my water freezing or the gutters on the back of my house falling. To replace my front gutters its going to be 160. Not as bad as I thought, so I am relieved about that. But I definitely learned an expensive lesson. clean the gutters out. Ice+Snow+a million leaves= a catastrophe. 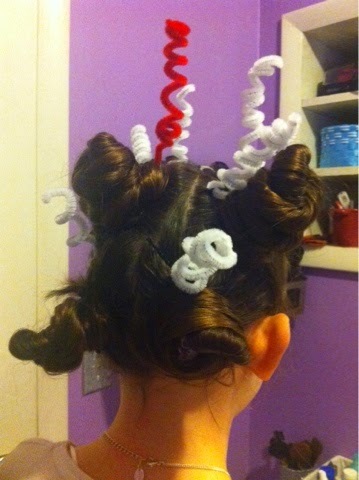 Emmy had crazy hair day at school on Monday. Pinterest to the rescue. This was so easy. 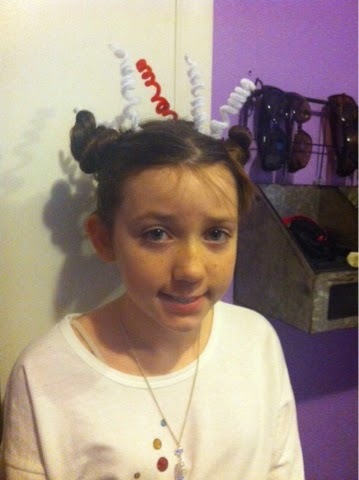 We made 5 little buns then took pipe cleaners, twisted them up and bobby pinned them in place. They don't give awards for craziest hair, but I think, if they did, she would have won. haha her hair looks awesome! I like Cat Hair and Glitter. It's tongue in cheek and it suits you. Can't wait to see the next addition to your brood! I love the crazy hair! Kudos for saving all the animals! And I love Cat Hair and Glitter as a name. I got a huge spike recently. Like from 50 pageviews to 500. I think it's some kind of web crawler or spam search thing, because I got a bunch of those around the same time. That must be it. I don't think I even posted on the day in question so I know it couldn't be something tat everyone wanted to read. Thanks to the dumb snow I haven't been able to get him. He had a vet appointment before I could bring him home. I'm so sad about it. Oh, what a sweet, sweet puppy. I can't believe people mistreat animals the way they do, but how great that you're taking her in. That crazy hair is so fun!